Its been more than a week since I posted as I was busy in office work. I was getting headache everyday due to long work and gulping down cups of coffee. Today finally I got a little break as this sprint release is over. Phew! Anyway, today let us explore a new concept of powder based face cleansers introduced by our blogger Sonali of Skincare Villa. I have been an avid reader of her blog for almost two and a half years. In fact, she was one of the bloggers who inspired me to write about beauty and start my own blog. As me and my other blogger friend used to discuss, she is like a senior blogger for all us newbies, who we look upto. Skincarevilla Sonali has recently started making her own products – face cleansers, face packs and facial oils. All her products are 100% natural without addition of any chemicals or harmful items. You can take my word for it! 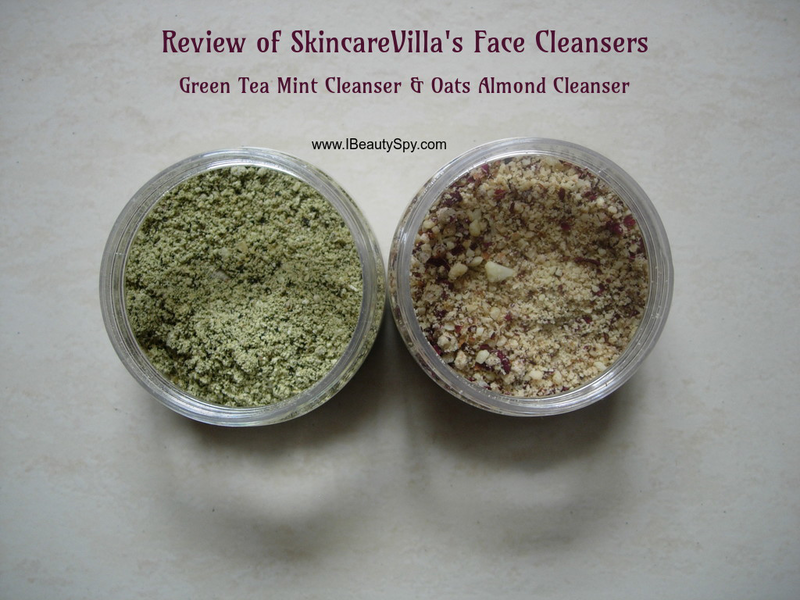 She had given me two of her products for testing which I will be reviewing today – Skincarevilla Oats Almond Cleanser & Green Tea Mint Cleanser. Read on to know how it works. Oats Almond Cleanser – Oats, Almond, Rose Petals powder, Almond seed oil, Grapeseed carrier oil. Oats Almond Cleanser – Rs.275 for 50g. Green Tea Mint Cleanser – Rs.250 for 50g. Take a small amount of cleanser and add water to make a smooth paste. Gradually massage your face in circular motions and wash off with cold water. 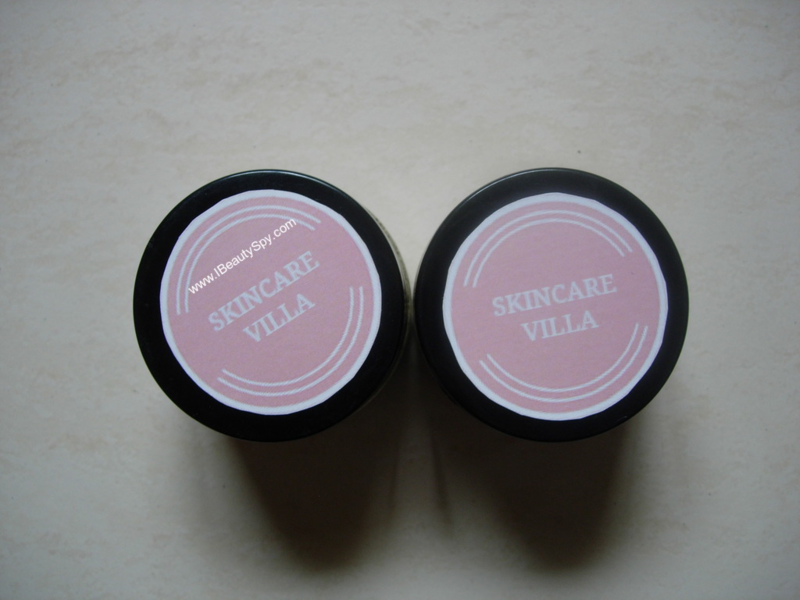 The cleansers come in cute little tubs with the brand name SkincareVilla printed on them. For now, she is sending the ingredients list and directions for use in nice handwritten notes. Powder based cleansers have been around for a while. But what is unique about SkincareVilla is that she offers a variety of powder based cleansers – Oats Almond Cleanser (which is her best seller), Rose Turmeric Cleanser, Green Tea Mint Cleanser, Anti Acne Cleanser, Anti Acne Face Pack, Ayurvedic Face Pack, Green Tea Detox Face Pack. So you can pick 3-4 of them and use different cleansers on different days to avoid boredom. Coming to the products sent for review, I have been using them for a month now. These are 2-in-1 products and can be used both as a cleanser as well as face pack. But I used it mostly as a face pack rather than a cleanser as I felt the particles were little big for my sensitive skin. I take about two teaspoons of the powder and mix it with curd. I apply as a face pack and leave on for around 20 minutes. Using the Green Tea Mint Cleanser was so refreshing and calming for the skin. Green Tea as we also know is packed with antioxidants which help to fight signs of aging. And mint is known to clarify skin. After washing off, my skin felt fresh, clean and calm. Oats Almond Cleanser, on the other hand, was a nourishing face pack for my dry skin. It made my skin so soft, smooth and brighter. Using it everyday can make your skin youthful and radiant. The fragrance of these two cleansers is totally natural. I love the scent of Green Tea Mint one. It instantly refreshes and relaxes the mind. The Oats Almond one has very mild scent of oats. Both these cleansers can be used everyday as they are gentle and totally safe for skin. As they are in a powder form, no preservatives are needed. You can also ask Sonali to customize products for you – like coffee oats cleanser, etc. And I shouldn’t end this post without talking about her latest launch – facial oil containing coffee infused oil, green tea infused oil, etc 😍. * 100% natural, handmade and no chemicals/preservatives. * Lot of variants to choose from. * Can be used as both cleanser and face pack. * Contain the goodness of green tea, oats and almond all of which are good anti-aging ingredients. * Gentle enough to be used daily. * Green Tea Mint one refreshes and calms skin while Oats Almond nourishes skin making it soft and supple. * Green Tea Mint has amazing natural scent. * With regular use, makes skin youthful and radiant. * Products can be customized as per your needs. * Particles were little big for my sensitive skin to be used as cleanser. Yes, the Green Tea Mint one. Availability: You can DM her on Instagram here or drop a mail at skincarevilla@gmail.com. Payment methods accepted are NEFT or Paytm. I have been using these as face pack for a month, alternating the Green Tea one and the Oats Almond one and my skin is looking and feeling really good. If you are looking for 100% natural face packs, cleansers without any harmful chemicals or preservatives, at a reasonable price, then do give SkincareVilla’s products a try. Even i have been an old reader of Sonali’s blog!! But i somehow missed on these cleansers… Seems like really promising from ur review… Can’t wait to try them..